I browse through Beauty Bay, Cult Beauty, Look Fantastic and Feel Unique pretty much everyday I won't lie, although it is usually just the New In sections. When I was browsing a month or so ago I spotted the Starskin Orglamic Pink Cactus Pudding and was drawn in by the name alone. Pink Cactus Pudding, it is just glorious! This is a skin-smoothing face and neck cream which soothes the skin and creates a long-lasting glow, containing prickly pear cactus oil and cactus extracts. So, why cactus? Cacti are full of vitamins and hydrators which have many benefits for the skin and when you sit it in skincare it is derived from prickly pear cactus seed oil, which is one of nature's most powerful oils. It is rich in Vitamins A, D, E and K, nourishing fatty acids, antioxidants, omegas, amino acids and water, in fact it actually contains 150% more vitamin E than organ oil and is sustainable. Cacti are obviously found in the desert, and so in such a humid and dry atmosphere, they must store mass amounts of water, and so when in skincare, they pass on these properties to our skin. Cactus not only helps to draw moisture into the skin but also improves the skin's ability to retain it by strengthening the skin's barrier function to prevent moisture loss. The ingredients Vitamins E and K help to smooth and soften the skin's texture, fatty acids calm any inflammation and antioxidants help to prevent environmental damage that triggers early signs of ageing. Genius! 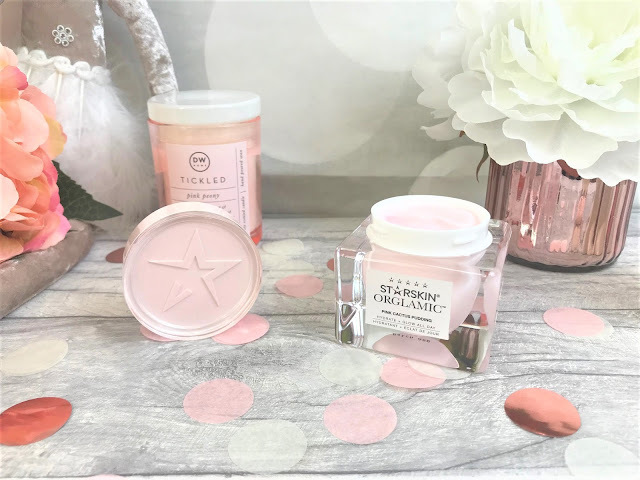 Starskin Orglamic Pink Cactus Pudding is to be used every morning and night, and on a morning should be your final skincare step before you apply your makeup as it smooths out the skin, which then allows your makeup to sit better. The product itself is a light pink in colour and does have that 'pudding' feeling to it, but I find that it doesn't feel heavy on my skin and that it melted into my skin almost immediately, to keep my skin nourished and moisturised throughout the day. The Pink Cactus Pudding is packaged in such a pretty jar, which is a little reminiscent of Glow Recipe's Watermelon Glow Sleeping Mask, and comes with a little spatula so that you don't have to stick your fingers into the jar, and also enabling you to get every last bit of product out. It has a fresh hydrating scent to it and keeps your skin glowing all day long. The Starskin Orglamic Pink Cactus Pudding costs £40.00 for 50ml and is available online at Look Fantastic.